Dove Cameron Online || Dove-Cameron.Org || Your Ultimate Fansite For Everything Dove! || With largest Dove Photo Gallery with over 20,000 images! Dove Cameron posted a video on her instagram announcing that she was cast to ABC Series Agents of S.H.I.E.L.D. For now we don’t have any information about her character but as soon as possible we’ll updated our site with new informations. 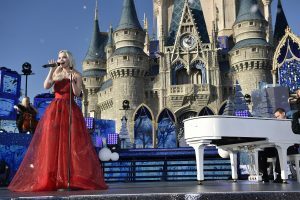 Last week Dove Cameron shot her presentation for Disney Channel Holiday Celebration and our gallery has been updated with a high quality picture of Dove at Disney Parks. 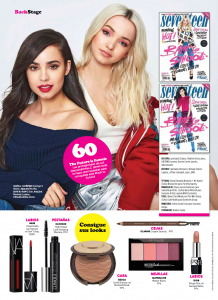 Last Month, Dove Cameron was in Tokyo to promote DESCENDANTS 2 alogside her co-star Sofia Carson. They attended the premiere and a meet and greet with their fans afterwards. 1) She is beautiful, in a warm and exuberant way that invokes a modern day Marilyn Monroe, all wide-set doe eyes, plump lips, and platinum blonde hair. 2) She was (is) a theater kid, radiating energy, talking with her hands, and effortlessly affecting a range of crisp voices and goofy facial expressions when she’s telling a story. According to Deadline, Dove’s cast in Dumplin, a comedy film based on Julie Murphy’s 2015 YA novel of the same title. Dove will starring this movie alongside Luke Benward, her co-star on Disney Channel’s movie Cloud 9. Jennifer Aniston, Odeya Rush and Bex Taylor-Klaus also are in the cast. The movie it follows Willowdean (Macdonald), nicknamed Dumplin, a confident, plus-sized teen who, to spite her beauty pageant queen mom (Aniston), enlists in a local pageant. What starts as an impulsive one-day protest snowballs as Will inadvertently becomes the inspiration for a ragtag group of teenage outcasts joining the pageant.